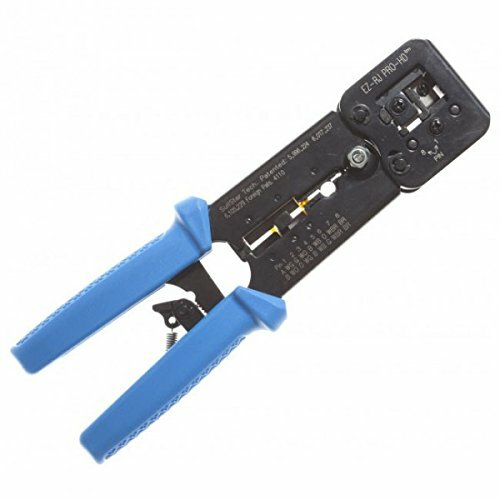 Most commonly used in the computer industry, crimping tools were also once common with phone technicians. They work by bending one or two pieces of metal to form a crimp, which then holds the pieces together. Network cables are crimped by placing wires into the crimper, followed by the connector, then compressing the two pieces so that they are pinched solidly together. 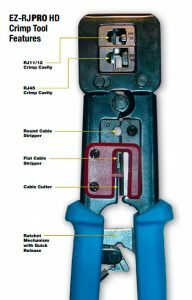 Modern crimping tools are used for a variety of connections and should be a part of every electrician’s kit. There are three major types of RJ connection: RJ22, RJ11/RJ12, and RJ45. Of these, the 8-position RJ45 connector is the most commonly used for data and network connections. The best RJ45 crimper needs to be high quality, easy to use, and have good alignment to ensure every connection is clean and consistent. 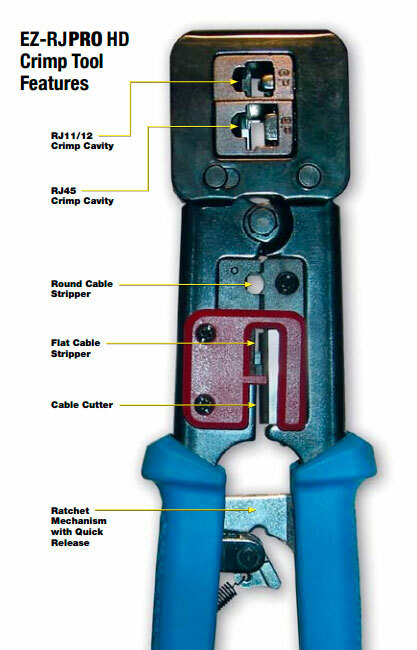 Each of the following crimpers are designed for RJ45 connections, but are also able to handle other connection types for maximum versatility. Platinum Tools seeks to take the guesswork out of crimping with the EZ-RJPRO HD. Compatible with the EZ connector system as well as standard modular plugs with the exception of AMP, this tool is designed to be the only one you’ll need. It’s constructed with a patented “crimp and trim” system to help ensure that every connection is both clean and flush. It also works well on heavier wire gauges and thick insulation. Finally, the ratcheted, high-leverage, stable platform includes 360 degrees of connector support with its steel die head assembly, giving it the ability to create uniform FCC-standard terminations with every use. Many users have claimed this to be the best crimping tool for its price range, and are quick to recommend it to others. They comment on the sturdy metal construction and ease of use, and the fact that it cuts wires and crimps means the wires can be sent completely through, allowing you to verify they’re in the proper order. As this is a versatile and quality tool, many users tout it as the perfect starter tool. A few have reported that the tool arrived with a defect in the die that causes alignment issues. This in turn will prevent pins 7 and 8 from crimping properly. It has been confirmed by Platinum Tools that two production runs totaling 6,000 crimpers failed to go through the hardening process. While most were caught, three batches (270 crimpers) slipped onto the market. The company is replacing them as they surface, so be sure to notify them and provide pictures if you believe you have one of these defective tools and they will remedy the situation. The VDV226-011-SEN is an all-in-one tool that allows you to cut, strip, and crimp both STP/UTP and flat-satin paired-conductor cables easily. The precision-ground, carbon steel crimping dies are complimented by a ratchet safety-release and blade-guard for the best experience in both quality and safety. Owners of the VDV226-011-SEN have found the quality to be higher than many similar crimpers (as is the case with most of the Klein Tools line). They note that it works perfectly for RJ45 crimping, and while it may have trouble scoring some smaller Cat5e wires, there have been no issues with terminating Cat5 and Cat6 connections. A few users have also commented that the tool is smaller than expected, making it easier to use if you have smaller hands or a weaker grip. Some users have complained that the tool cuts too deep when stripping Cat5, 5e, and 6; causing minor damage to the wire. Additionally, as with many tools on the market, it’s easy to end up with a Chinese knock-off if you don’t purchase through a reputable site. The Chinese versions tend to have loose dies, and when used as an RJ45 crimp tool, they almost always have difficulty cutting the 7 and 8 pins. TRENDnet has created a tool specifically designed for 6- and 8- position modular plugs. The all-steel construction is compact with easy-to-use hand grips for a more enjoyable experience. 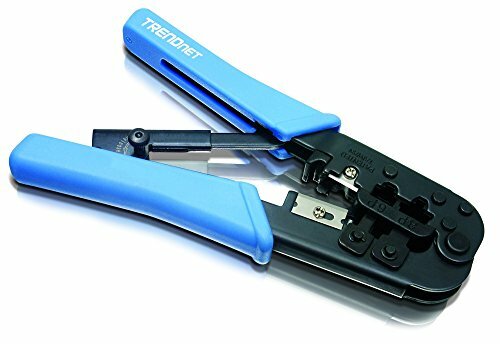 Perfect for working with RJ45 and RJ11/RJ12 connections, the tool is able to crimp, cut, and strip flat cables with ease. Stripping round Cat5/6 cables is also possible, thanks to an adjustable cutting depth. While users have had many positive things to say about the TC-CT68, one of their biggest comments has been on the low cost. The quality approaches that of many more expensive tools, and owners have noted that it works perfectly for making RJ45 terminations. Many professional users state that this tool holds up for both home and industrial use with no loss of quality. One of the main complaints about the TC-CT68 is in regards to the ratcheting when trying to store the tool. The handle must be squeezed slowly until it clicks, as closing it all the way will result in it springing open. Another common complaint is that it can be easy to nick Cat5/6 cables when stripping if you are not careful. Finally, cuts are not always cleanly made, and users often ignore this feature entirely. Where are these crimpers made? I assume Klein Tools is in the USA? Actually, all 3 are made in Taiwan. Normally Klein Tools are made in the US but these actually say made in Taiwan on them. The quality of both the Klein Tools and Platinum Tools models are excellent though.